I've been wanting to make popovers for a very long time. Frankly, I'm not sure why it took me so long--maybe I just thought they would be hard to make. Whoa...was I wrong. These are so, so easy! ﻿I didn't bother to take pictures of the actual making of these. First preheat your oven to 450 degrees F. Then, just break 2 eggs into a mixing bowl; beat them slightly with a whisk. Add a cup of milk (I used skim--I don't think it matters what kind). Whisk again. Slowly add 1 cup of all-purpose flour and a dash of salt. Beat it just until the batter is smooth. Fill each section of a 6-section popover pan (use a muffin pan if you don't have a popover pan--and grease it up if it isn't non-stick) about 1/2 full. Bake at 450 degrees for 20 minutes, reduce the heat to 350 degrees and bake for an additional 20 minutes. Pull them out of the oven and eat them immediately. Preferably with butter and honey. They will be gone in minutes. Some were a little misshapen. It mattered not. Gave them some character. I served mine with tomato bisque. Pete wanted me to make another batch immediately for leftovers, but I think they taste best eaten right away, so I'll just whip up some more when we are ready. 1. Thank the person who presented the award, and link to their blog in this post--thanks, again, Angela! 2. Copy and paste the award image (see above). 4. 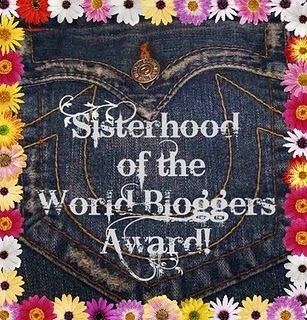 Pass on the award to fifteen other fabulous blogs, and let them know that they have received the award (below). 1. I was born in Wisconsin and am proud to be a Cheesehead. 2. My first "real" job was teaching people how to use electronic typewriters and word processors. This was before the Internet. Let's not talk about how long ago that was. 3. My major in college was French. It would require a full bottle of wine for me to speak French today, however. 4. I am a Harry Potter geek. 5. I am so uncoordinated that I got a "D" in gym class in high school. Seriously, the uneven parallel bars? Do they still make kids use that? 6. I've lived in 6 states, including California and Florida. Minnesota is my favorite, despite this long, nasty winter. 7. I am addicted to Diet Coke. 1. To Danielle from Cooking for my Peace of Mind ---Great bread recipes. Plus there isn't a chicken she doesn't know how to cook! Danielle inspired me to create my blog. 2. The best Italian food you could ever imagine: My Italian Grandmother Michele is one of my BakeSpace Beeps! 3. Need something Gluten-Free? Try Retired with No Regrets Lee makes her own gluten-free goodies and is on the way to writing her own cookbook. 4. Chris from Hye Thyme Cafe makes wonderful Armenian food along with everything else. 5. Spryte's Place is well known for all sorts of goodies. Look up her Rollo Cookies and her Faux White Castles--to die for! 6. Karen has the most beautiful gardens and stained glass. You can see for yourself on her blog Quarry Garden Stained Glass. 7. Moni is a baker and cake decorator extraordinaire. Check out Alaskan Dermish in the Kitchen. 8. Dajana lives in Italy. She makes fabulous treats and shares them on her blog: Baker's Corner....Somewhere in my Kitchen. 9. Sheryle makes homemade goodness...and lot's of cookies(!) on her blog Cookiebaker's Corner. 10. I'm going to put it out there...even though he's a "brother", his blog belongs in the "sisterhood", Shane has been a huge influence on me with his culinary knowledge. Find him at Culinary Alchemy . Do it. 11. Susie is a fellow Bake-Off contestant. She cooks and shares on her blog Hick Chick --love the name! 12. I met Emily at The Best of the Midwest cook-off--she's kind of hot stuff, what with being on the Ultimate Recipe Showdown two times! Her blog Sugar Plum is amazing. Incredible food and incredible pictures. 13. My friend DeeDee doesn't post often enough--her cake decorating skills are unmatched. Find her at DDPie's Slice. 14. Kristen is a SAHM who not only makes awesome food, but tells a good story every Saturday on her blog Frugal Antics of a Harried Housewife. 15. And let's not forget my friend, fellow Minnesotan and fellow Bake-Off contestant, Laura, who shares recipes and design on her blog Ohmydoodle.